The Yale School of Music presents a concert featuring Guitar Chamber Music: guitar ensembles as well as guitar alongside other instruments. 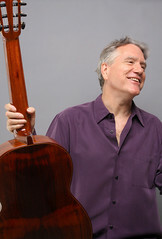 Celebrated guitarist Benjamin Verdery, the chair of the guitar department at the School of Music, is the director of the concert. The program takes place at 8 pm on Wednesday, May 2 at Morse Recital Hall in Sprague Hall (470 College Street, New Haven). Karl Pilss’s Sonatine for oboe and guitar will open the program; next is Louis Andriessen‘s Hout (written in 1991) for the colorful combination of tenor saxophone, electric guitar, piano, and marimba. Also on the concert are two intercultural fusions: Ravi Shankar’s The Enchanted Dawn for flute and guitar, written on the Indian Raga “Todi,” and Benjamin Britten’s Songs from the Chinese, Op. 58, a set of six songs for tenor and guitar written in 1957 on translations of classic Chinese poems. New music by Yale composers will round out the evening: Baby Boomers for four electric guitars, by Jack Vees, and the Duo for classical guitars by Daniel Schlosberg ’13MM.